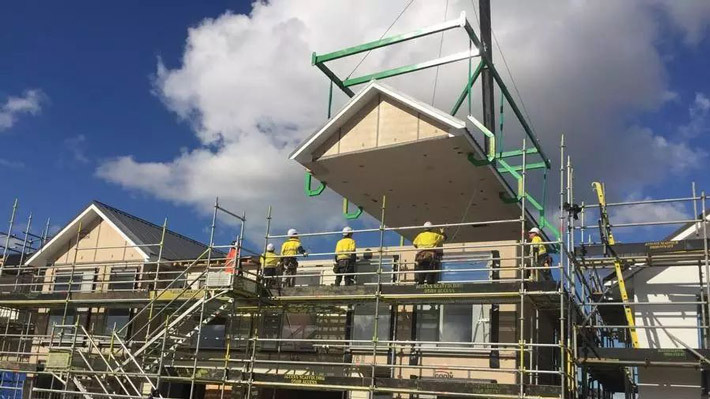 New Zealand’s largest construction company has unveiled a fast new building technique that enables it to erect a house in a day. Fletcher tested its technique on a two-storey duplex, prefabricating the walls and roof in a factory. Each $935,000 185sqm house that boasted four bedrooms and a tandem double garage took four days to build and six weeks to finish. “The finishes are exactly the same as any other house that is built conventionally,” Fletcher Living’s Steve Evans claims. The key to process is panelizing, fitting each wall and floor panel with the plumbing, electrical work, insulation and gib board assembled in a factory. Once signed off by the council, the weather-tight house takes another five to eight weeks to finish. This means one building crew could construction six houses a year instead of the current one and a half. “It’s accepted that Auckland needs 14,000 new homes built each year,” Evans notes. Fletcher plans to build a terraced house built with panels and then decide whether to build a factory to start mass production. However, cost benefits will have to wait as Evans concedes that the cost will eventually be cheaper but not at present.